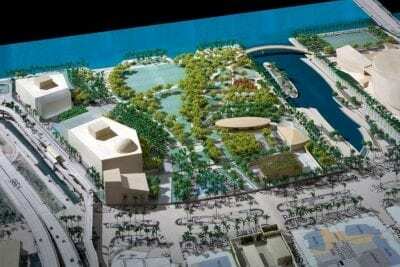 EE&G I Miami Art Museum City of Miami’s Brownfields Redevelopment Grant. EE&G’s staff has actual environmental experience working on Bicentennial Park (and surrounding areas), under Evans, who conducted due diligence assessments on behalf of the City of Miami, which were funded by EPA-awarded Brownfields Assessment Grants. EE&G’s designated Project Manager for this contract, Mr. Craig Clevenger, P.G., directly managed the due diligence assessment completed on the subject property, Bicentennial Park, and prepared the Phase I and Phase II Environmental Site Assessment Reports. Mr. Clevenger has actual knowledge of the environmental conditions that persist at the property, and the clearly understands and can help overcome the challenges faced by proposed redevelopment plans. This property was historically the original Port of Miami. The northeastern portion of the property (and northern-adjoining property) was part of the Belcher Oil facility, which maintained numerous large aboveground and underground storage tanks (ASTs and USTs) for the storage and distribution of petroleum products. The western boundary of the property was developed with several gas stations, and surrounding facilities of concern included dry cleaning facilities, automotive repair facilities, print shops, the Miami Herald newspaper sites, and various commercial/industrial sites. EE&G identified the presence of petroleum-affected soil and groundwater on the northern portion of the property, area-wide arsenic-affected surficial soils, and the presence of two improperly-abandoned USTs on the western boundary. EE&G permitted and properly removed the USTs in 2003, and completed a Tank Closure Assessment Report. Recommendations included expanded site assessment and proper management of the affected media coinciding with the proposed redevelopment plan. Additionally, EE&G recommended that this property be officially designated as a Brownfields Site in order to take advantage of the available financial (tax credits) and regulatory (RBCA closure) incentives. EE&G has continues to provide environmental consulting services to the Miami Science and Art museums currently under development at the site as well as the contractors conducting the work at the site. Click Here to know more About Us. Go to our Careers page to check out the latest job openings.